All egg breakfasts are served with 3 eggs, hash browns or home fries or fruit, choice of toast, muffin or homemade biscuits and gravy. All omelette breakfasts are made with 5 eggs, hash browns or home fries or fruit, choice of toast, muffin or homemade biscuits and gravy. We Grate Our Cheese Fresh Daily! Bacon, ham, sausage, onion, bell pepper, mushroom & cheese. Smothered in country gravy. 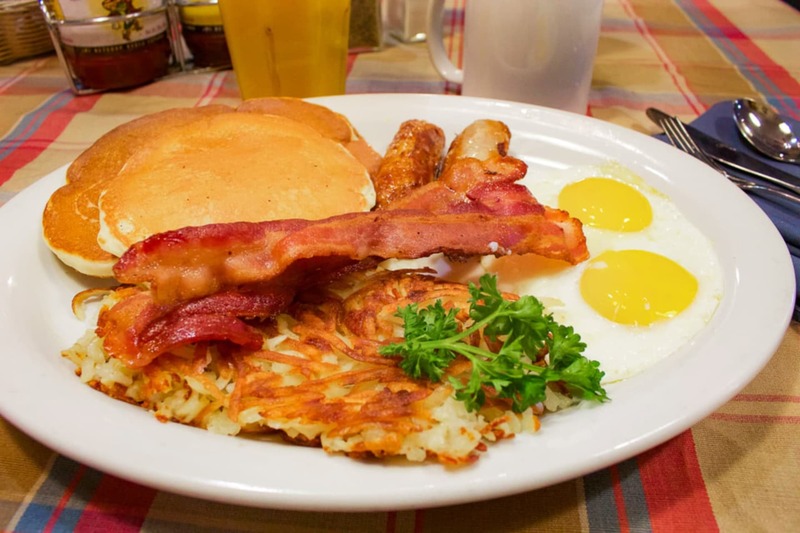 All skillet breakfasts are made with 4 eggs on a bed of hash browns or home fries, with choice of toast, muffin or homemade biscuits and gravy. Served with 3 eggs, hash browns or home fries or fruit, choice of toast, muffin or homemade biscuits and gravy. Corky's pancakes are so large, you've gotta see them to believe it! If you're a granola lover, you'll LOVE Corky's granola pancakes! Served with cheddar cheese and choice of bacon or ham. Corn tortilla topped with refried beans, cheddar & jack cheese, homemade pork chili verde & three eggs any style. Choice of potato & choice of corn or flour tortillas.